The Utah Division of Arts & Museums presents On the Border of Realism September 14 through November 2, 2018, at the Alice Gallery. A Gallery Stroll artist reception will be held on October 19 from 6pm to 9pm. The Alice Gallery is located at the historic Glendinning Mansion at 617 East South Temple in Salt Lake City and is free and open to the public Tuesday through Friday 10am to 4pm. 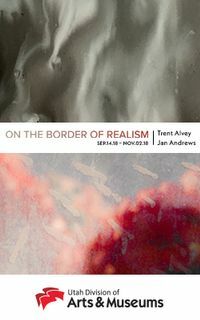 On the Border of Realism features the artwork of Jan Andrews and Trent Alvey. These artists are inspired by capturing the transitory moments of everyday life, the movement of light, and the impressions these illuminated scenes leave on the senses. Both use photography as their medium, but use different subject matter for inspiration. Alvey photographs water mixing with paint in a paint tray, while Andrews photographs flowers through hazy greenhouse windows.